If working on your past-lives is what you fancy, the Soul Healing session is what you need! Why sign-in to my newsletter? 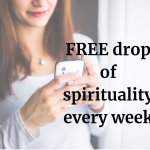 When you sign-in to my newsletter, you’re in to receive a delicious dose of spirituality on a weekly basis. I love to add value to your life by helping you deepen the spiritual connection that you have with yourself and life in general. +++ Be the first to know about my special offers, events and more! I promise I won’t spam you… If you decide it’s not for you, a simple click will unsubscribe you from my mailing list! Learn about spirituality and spice up your life! Receive my weekly email, so you can have the 'something more' waiting for you, ready to help you expand and grow!